Nicholas was hassling me upload this screenshot, so here it is. 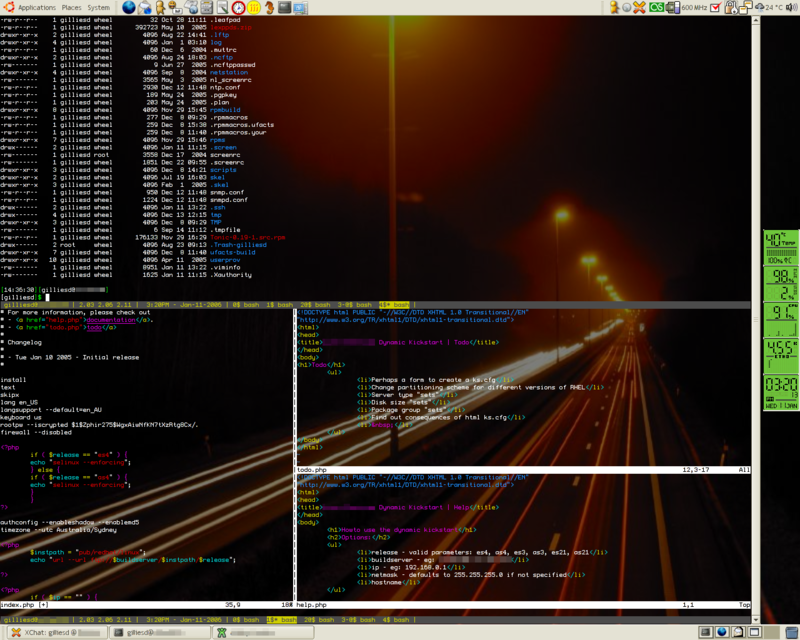 On my IBM ThinkPad T41 at work, I’m running the OpenBox window manager in Ubuntu 5.10 Breezy Badger. In this session, gnome-terminal (with decorations removed) is ssh’ed into a server, with a split gnu screen session (my current .screenrc), with one of the screen sessions running vim with three split windows. I’m working on a php script which creates dynamic kickstart files for Redhat Enterprise Linux installs. To split a screen in screen, its ctrl+a S, then ctrl+a tab to jump between the screens. In vim, its ctrl+w s to split the screen horizontally, ctrl+w v to split the screen vertically and then ctrl+w w to jump between the screens in vim. I updated to GNOME 2.7.x last night from Nyquist’s RPM repository, prompted by PhotoMatt’s post on GNOME 2.8. I’m also using jdub’s Indubstrial theme, which has been “suggested” to be the standard theme for GNOME 2.8. Also running is RealPlayer 10 streaming C-B-S. So far it seems to be very stable. Actually the most stable I’ve ever seen GNOME (not to say that it hasn’t been stable for a while). But considering that the PC that its running on has a PIII 733Mhz CPU, I’m pretty impressed. Its a VNC session connected to VMWare GSX host session running Windows 2000 Professional, running a Cygwin session which is ssh‘ed into my laptop and then forwarding X11 windows from my laptop. Fitting in the category of “it shouldn’t be this bloody hard” was getting my IBM ThinkPad T40 working in Xinerama mode under Linux. My laptop is currently setup with Redhat Linux 9.0 and all the latest updates. I’ve been wrestling with it for a while to get it working. Every site I’ve had a look at seems to have a slightly different setup in their XF86Config with never seemed to work for me. Most users who use Xinerama seem to be either Debian or Mandrake users, so that might be the reason. Anyhow, here is my XF86Config file. Currently it only has support for doing straight Xinerama, nothing else. When I get the chance I’ll update it and write a script to detect the prescence of an external display using tpctl so it can decide whether to go dualhead or not. Update 20/02/04: Alright. No need to fudge around with detecting the second display. It would seem GDM (or is it XFree86?) is smart enough these days to figure out whether the second display is there or not. IBM ThinkPad T40 running Redhat Linux 9.0. The window manager is Fluxbox. Crossover Office is running Internet Explorer 6.0.